Unlike the mighty Space Marines of the Imperium, the Chaos Space Marines must rely on their rank and file being filled with cannon fodder......This chaff is most normally made up of the Heretics and Traitors of the human worlds infested with the taint of Chaos, while others are forced to serve after they have died. This is the fate of many Imperial Citizens. After the Death Guard have attacked, even if repelled, the populace of an Imperial planet my find itself set upon by a myriad of sicknesses, and those that die from these illnesses do not normally just stop fighting. After death, they rise again to form one of many forms of zombie like beings. 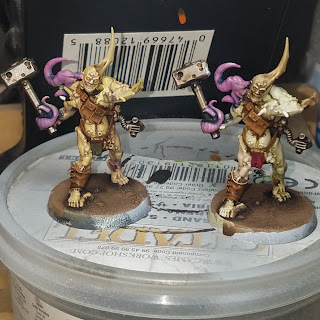 These can sometimes be Pox Walkers. 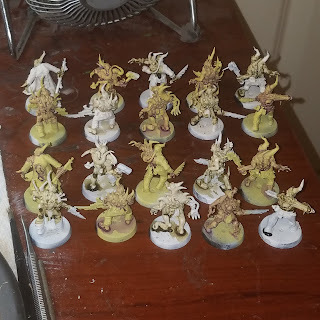 In the Dark Imperium core set, the Nurgle force is augmented by 2 units of 10 Pox Walkers. These shambling hordes are usually found marching, if it can be called that, in front of the elite forces of the Death Guard, forming an inhuman shield of poxy destruction. I decided to break the pox walkers into 2 units, and have them be distinguished by the colors of the tattered remnants of clothing and uniforms. To throw in some variation, I painted the flesh tones in 2 colors, utilizing different washes, and then mixed the two up. 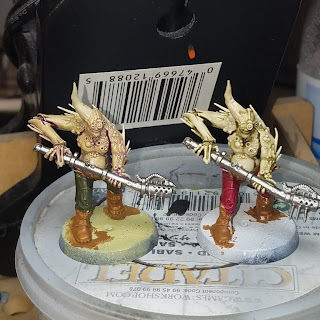 Once dry, I used GW Lahmian medium to reduce a wash of GW Druchii violet, and applied that to the models shot in VGC Dead Flesh, and then applied a reduced wash of GW Athonian Camoshade to the ones shot in GW Pallid Flesh. 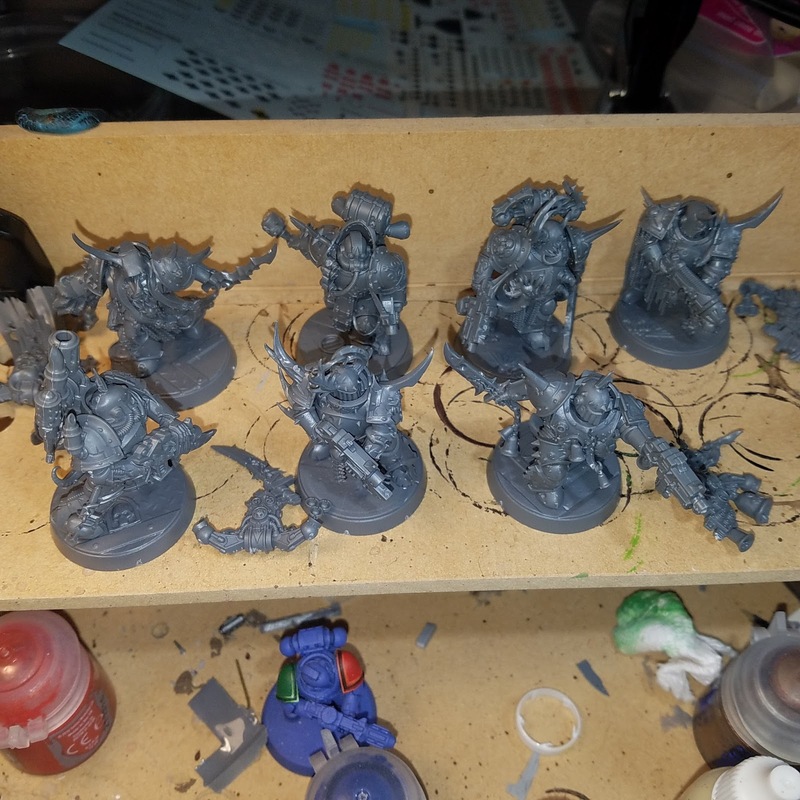 I then mixed the units, and made sure that no 2 of the same model were the same flesh tone in the unit. I applied the base colors - VGC Beasty Brown for the leather, GW Leadbelcher for the metals, and then one unit got cloth painted in GW Khorne Red, the other GW Castellan Green. All of the horns were painted in GW Ushabti bone. 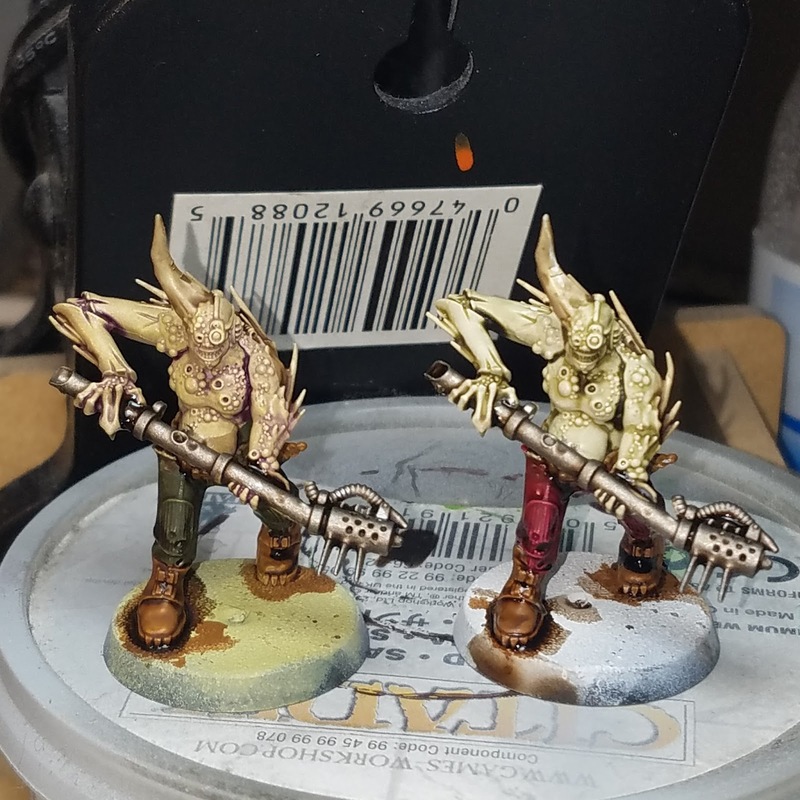 These areas were then washed with GW Agrax Earthshade. 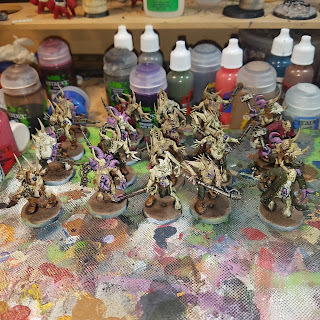 Once dry, all of the tentacle growths and areas of open skin were painted with GW Emperor's Children, and then washed with GW Drakenhoff Nighshade. 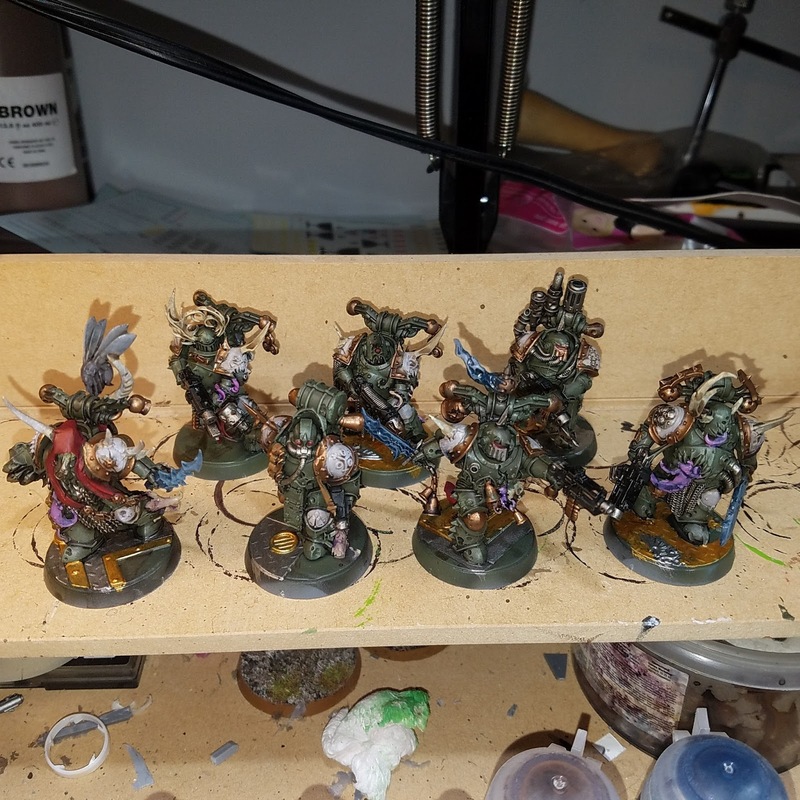 I based them all with GW Agrellan Earth, and once dry, applied a wash of GW Agrax Earthshade. Once that was dry, I applied a drybrush to the bases of P3 Menoth White Highlight, and then painted the rings in GW Abbadon Black. And here they are, nestled in with all their compatriots, ready to wage a disgusting war on the Imperium! 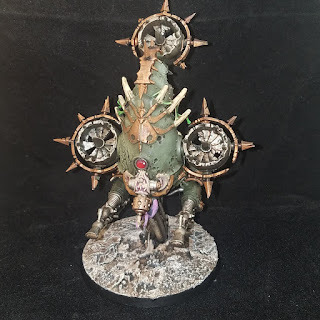 In the Dark Imperium box set, next to the Lord of Contagion, the Foetid Bloat Drone is the centerpiece of the army. 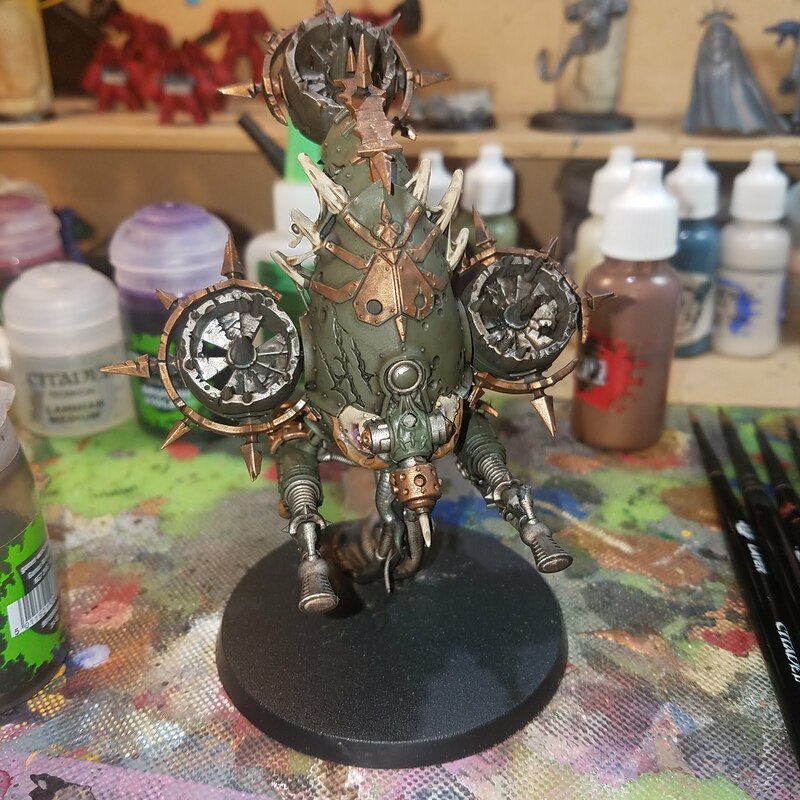 It is an eye catching model, taking the best of the design that Forge World had created for the bloat drone, and made it even better. Assembly was straight forward, but in hindsight, I should have left the guns off until after painting. It has a very large base, and I didn't have the resin or other nice things like the Sector Imperialis base to spiff it up, so it will be done with just straight texture instead. 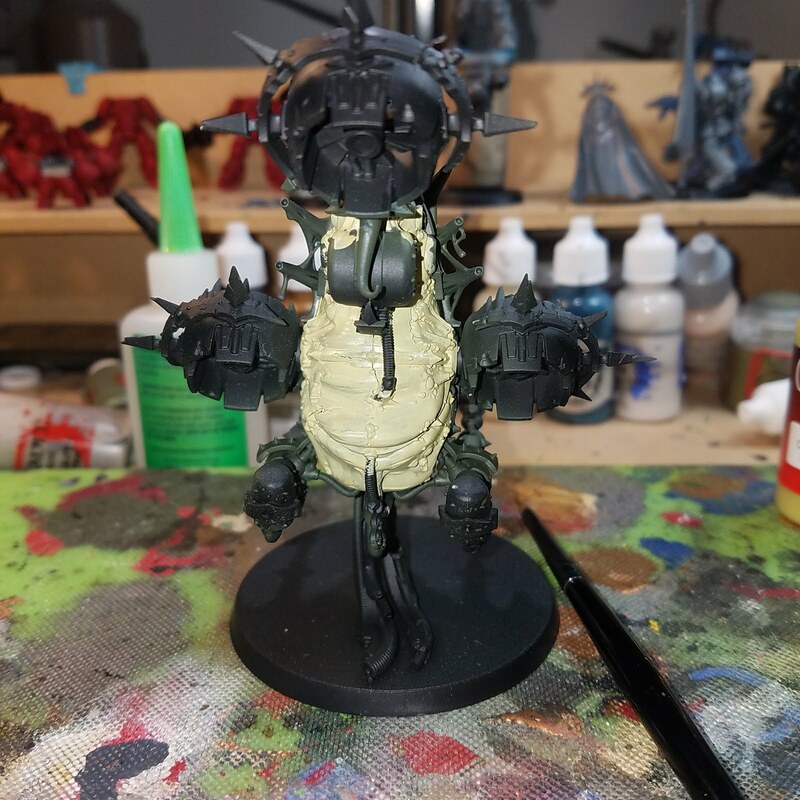 I assembled the model and primed it black with Vallejo Polyurethane Acrylic Black Primer and then base coated the model with GW Castellan Green, both ran through an airbrush. I then painted the rear of the model, which looks like a bloated flesh sack, with VGC Sick Flesh. This was followed by a wash of GW Druchii Purple, mixed 50/50 with GW Lahmian Medium. After this was dry, I started color blocking out the rest of the areas. Hoses and piles, guns, and centers of the engine fans were all painted in GW Leadbelcher. Decorative trim and various other pieces were painted GW Balthasar Gold. Some of the hoses had this weird kind of sheathing on them, so I painted those with VGC Beasty Brown. 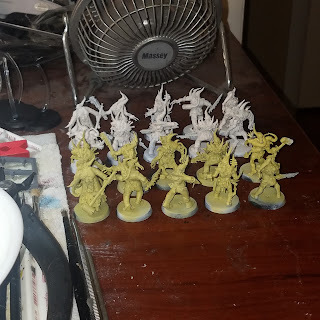 All of the horns were painted in GW Ushabti Bone. 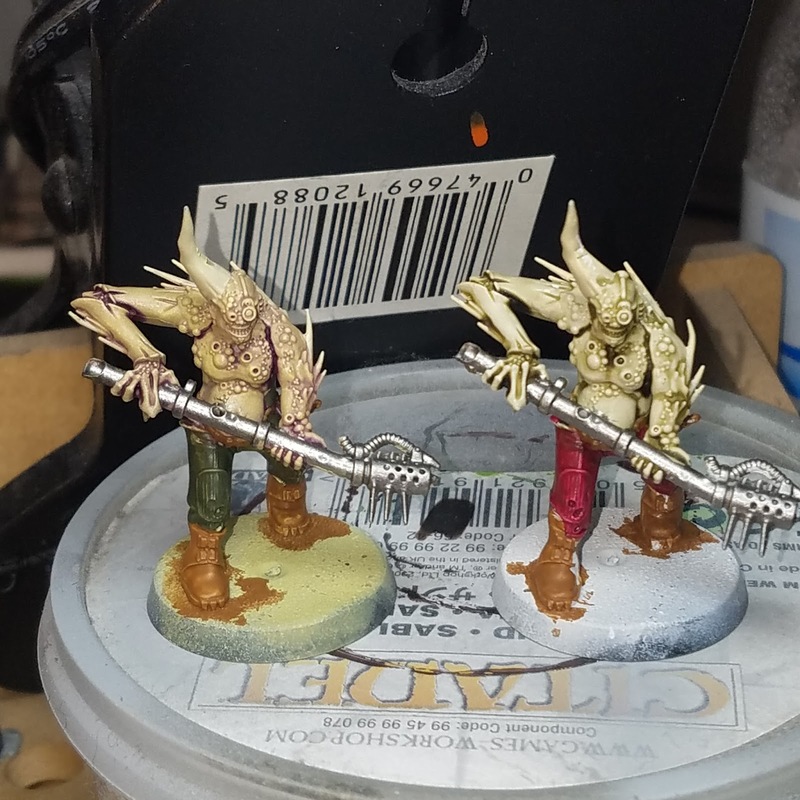 Once all dry, I applied a wash of GW Agrax Earthshade to those areas. 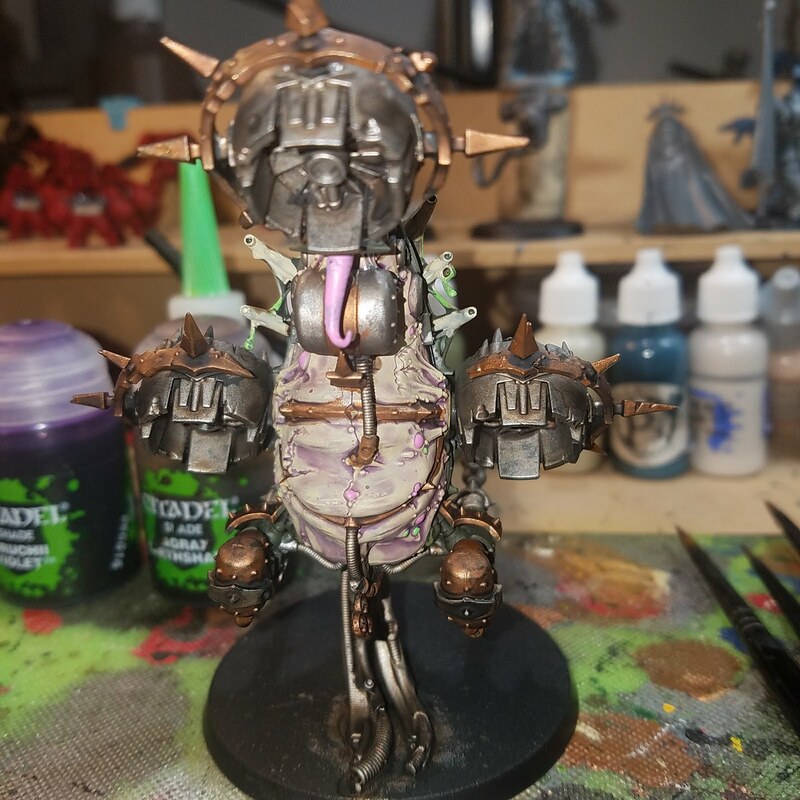 I added VGC Sick Flesh to the "face" area as that appeared to be fleshy, and then GW Emperor's Children to the tentacles on the front and back. I also added pink, as well as VGC Scorpy Green to the larger pustules on the drones flesh areas. 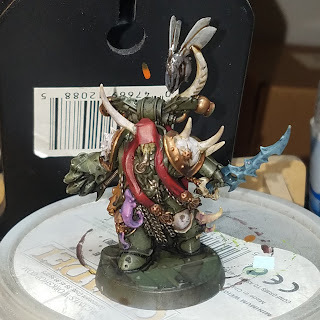 Using the same wetbrush technique I used on the Plague Marines, I brought the dark greens areas back up, applying a wet brush of GW Castellan Green, then GW Deathworld Green, and then finally GW Straken Green. 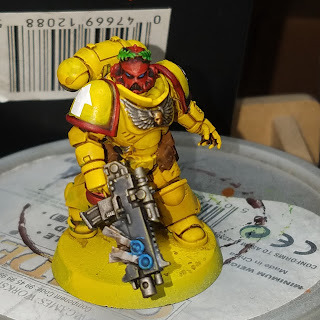 The gold areas were given a fine highlight of GW Balthasar Gold. I painted all of the stringy bits between the carapace and the horns with VGC Scorpy Green, and gave them a wash of GW Biel Tan Green. 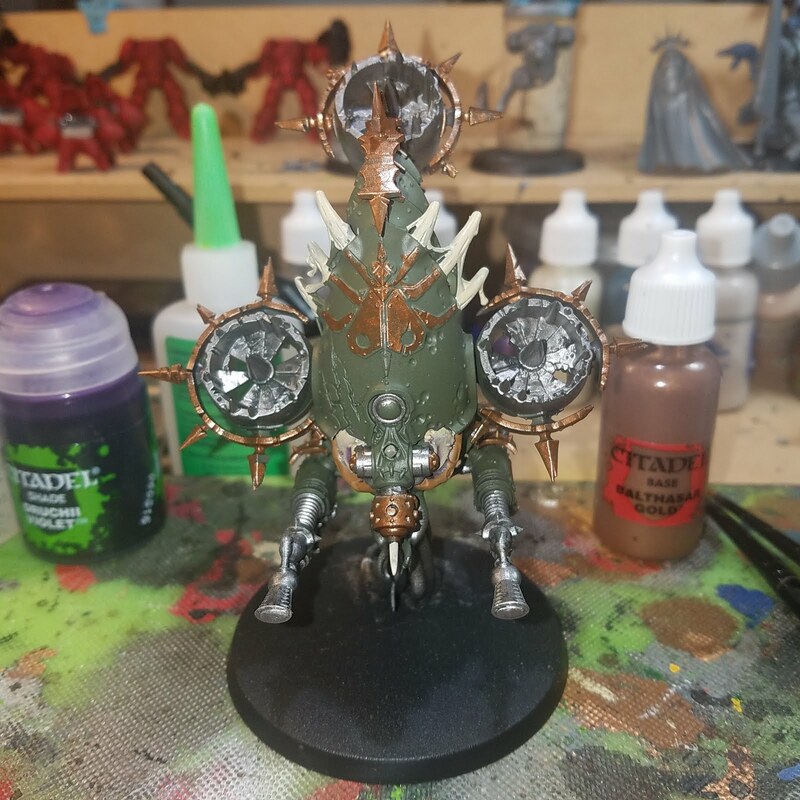 For the eye, I painted this GW Khorne Red, followed with a GW Nuln Oil wash.
Once the eye was dry, I reapplied GW Khorne Red, and then did a bottom edge highlight of GW Evil Suns Scarlet. 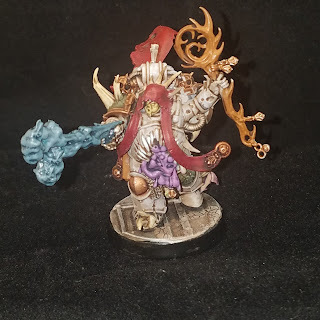 I followed this with a dot of GW White Scar in the darkest portion. 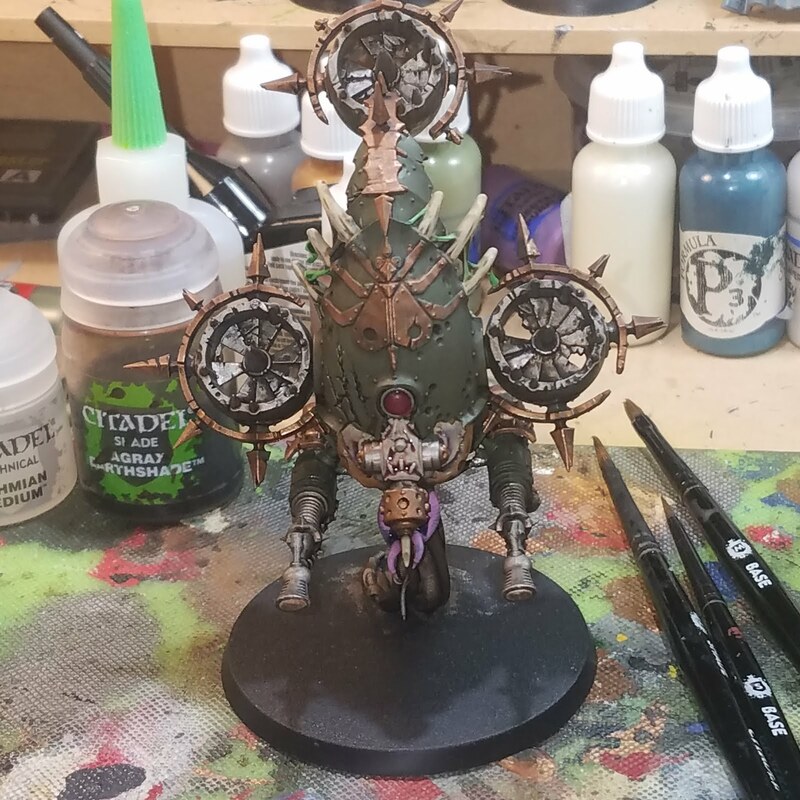 And here is the finished model. I think this was my 2nd favorite out of the Nurgle models to paint, next to the Lord model. 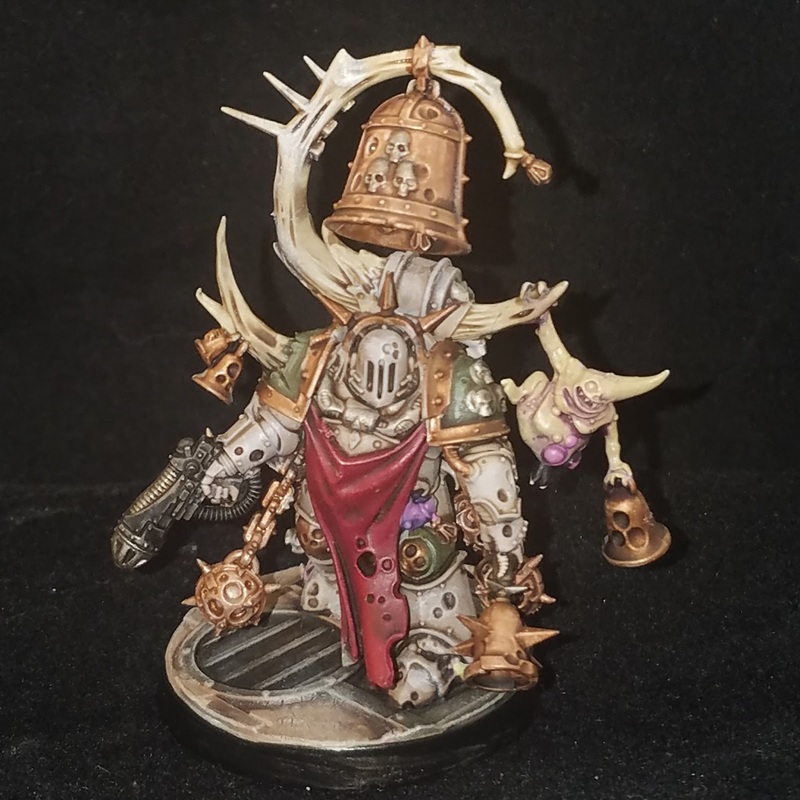 So, along with 7 Plague Marines (7 is the Chaos Gods favored number), the Warhammer 40k Dark Imperium also comes with some pretty spectacular Death Guard Characters. 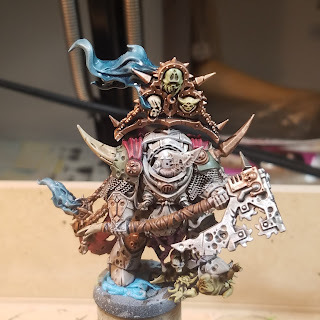 Lord of Contagion , a huge Chaos Space Marine covered in corrupted Terminator armor armed with a plague-reaper axe. Noxious Blightbringer, a Chaos Space Marine banner bearer, armed with a cursed plague bell and a plasma pistol. 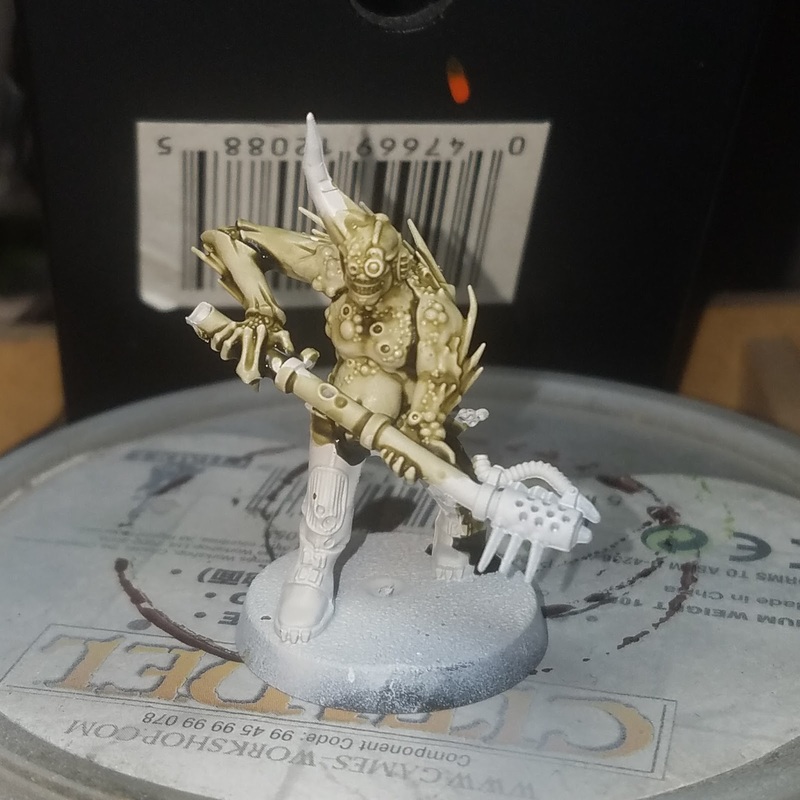 Malignant Plaguecaster armed with a corrupted staff and bolt pistol. I have to say, these are some of the nicest core set models ever produced. Not a lot of room for conversion, but really well sculpted and a great representation of the high powered followers of the GrimDarks Lord of Decay. For this paint tutorial, I am using a variation of the paint scheme I posted here. 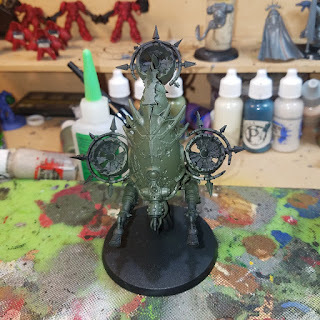 I figured that the more powerful models would be from the original legionnaires of the Death Guard, just warped after 10,000 years in the eye of terror. 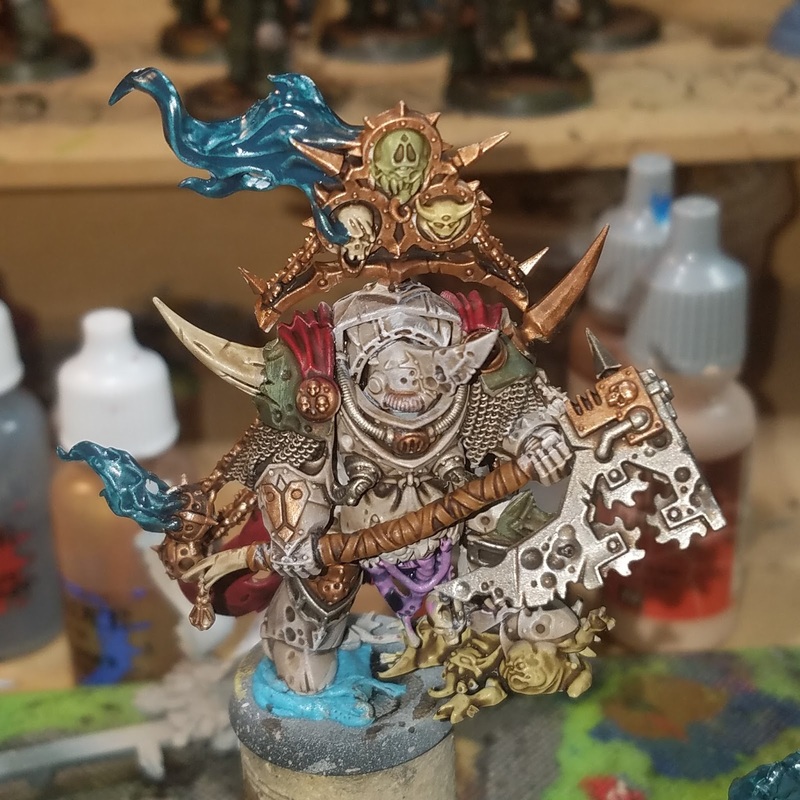 I block painted all three models at one time, as they are all using the same color scheme. 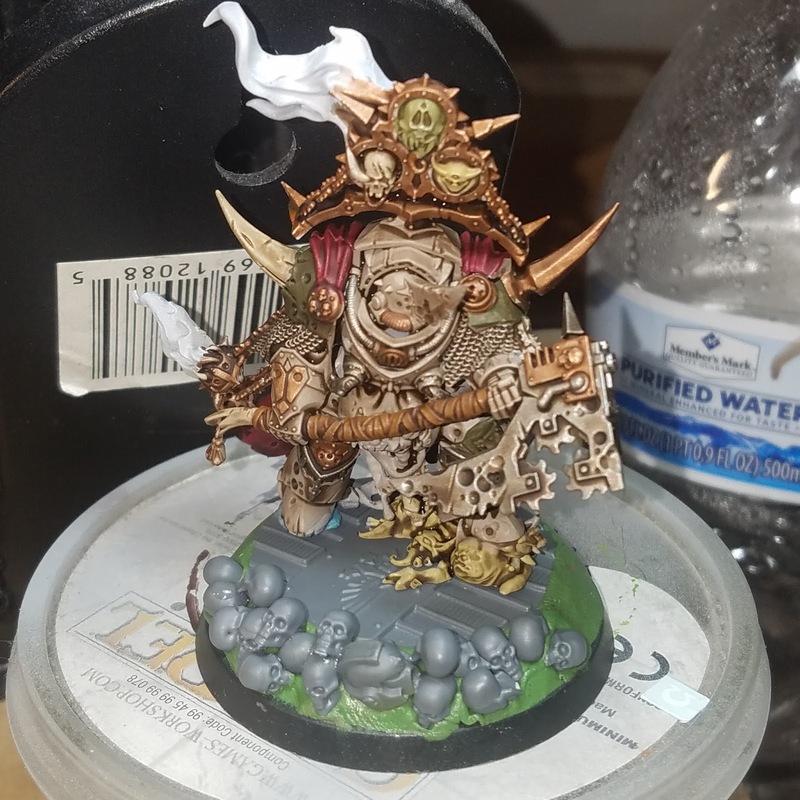 I left the Lord off of his base, as I wanted to do a more scenic base for him, as well as be able to paint the inside of his cape. I started off with a white primer followed by a coat of GW Rakharth Flesh, both applied with an airbrush. I took GW Castellan Green and blocked out the shoulder pads. 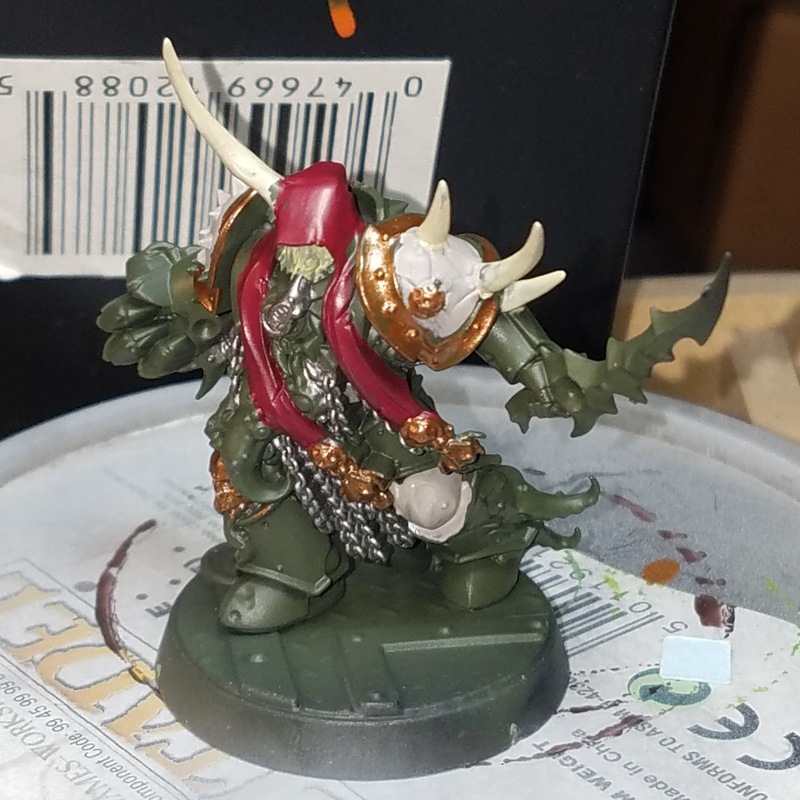 I then blocked out the cape in GW Khorne Red, leather straps and doodads in VGC Beasty Brown, mail and axes blade in GW Leadbelcher, smaller details in GW Balthasar Gold. 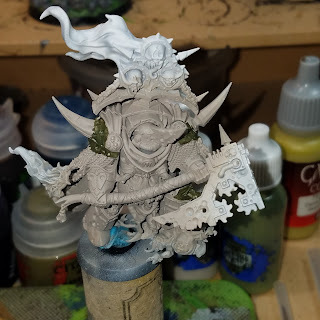 For the three heads in the Nurgle Icon, I went with GW Rakharth Flesh for the skull, GW Deathworld Green for the Plagueberor head, and VGC Sick Flesh for the Nurgling Head and for the pile of Nurglings that the lord is standing on. A quick shot of the detail on the back. Once all of this had dried, I gave the model a wash (the whole model) with GW Agrax Earthshade. I left it to dry and setup the cooler base, which the model is pictured on above. 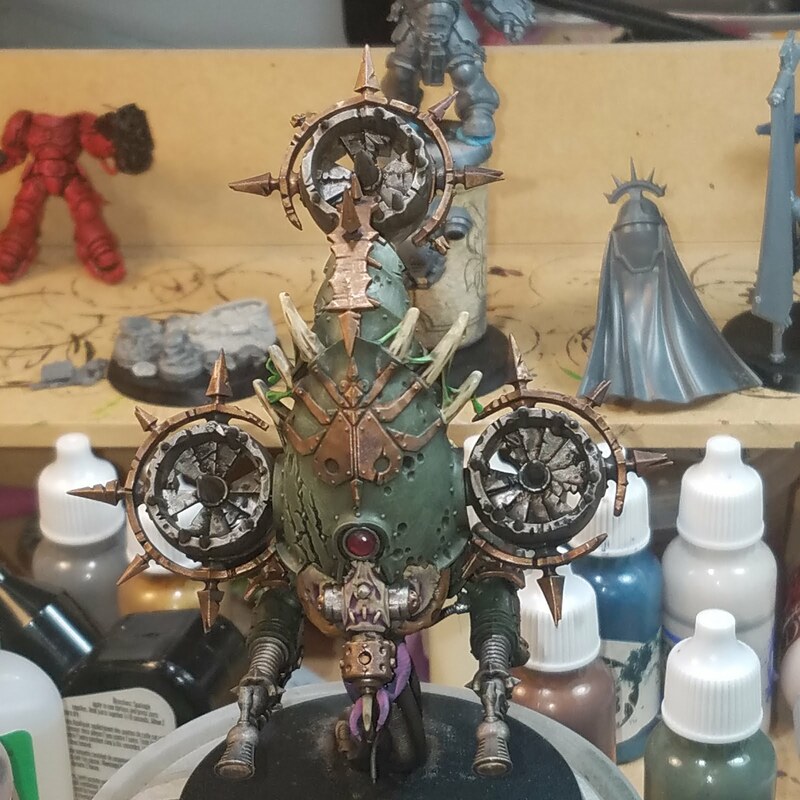 For the smoke pouring out of the braziers, I applied a mix of GW Sotek Green and GW Abaddon Black, 75/25. To start re-highlighting the armor, I used GW Rakharth Flesh and applied a wetbrush technique to all of the bone armor parts. Using the same technique, I reapplied the base colors on the green, red, gold, and silver. The entrails were painted in GW Emperors Children, and then washed with Drakenhoff Nightshade. 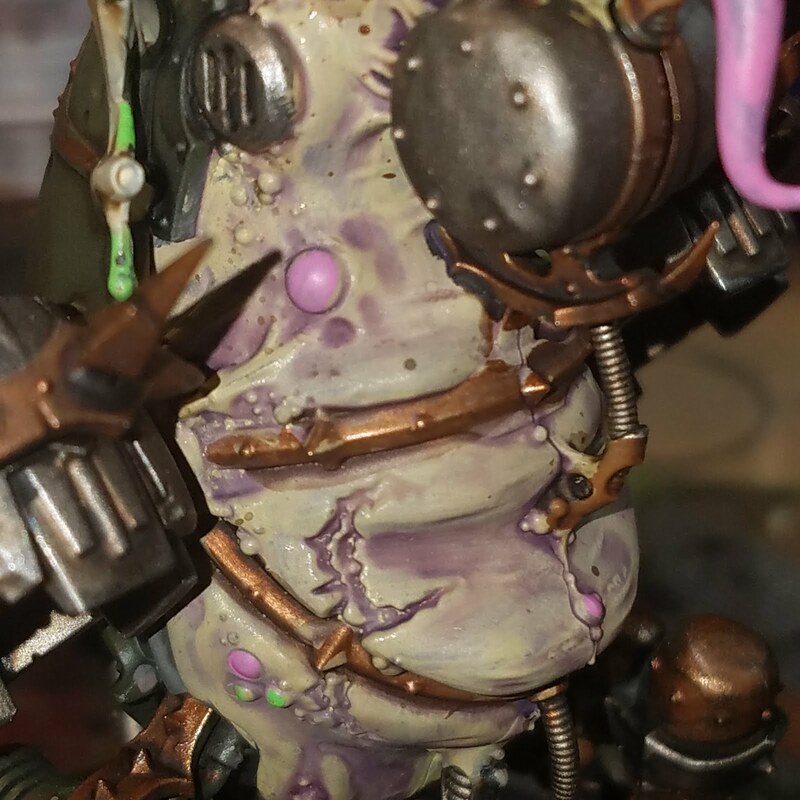 Any flesh protuberances were painted in VGC Sick Flesh, and given a thinned wash of GW Druchii Violet. 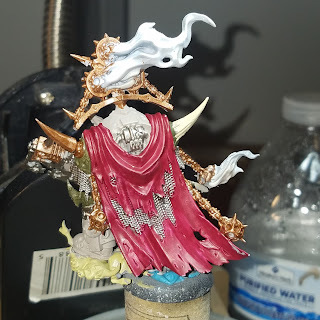 On the smoke, I applied successive layers using the same wetbrush technique, adding GW Dawnstone to the Sotek/Black mix. I added in a drop at a time, successively, until I reached the Dawnstone color. 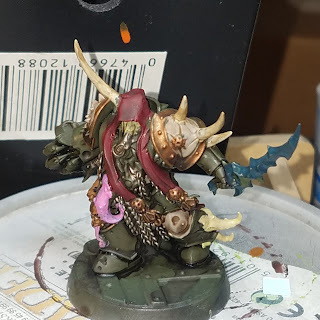 A further applied the wetbrush technique to apply GW Pallid Wyche Flesh to the bone areas, GW Straken Green to the green, and GW Mephiston Red to the red areas. And here are the finished models! I hope you all enjoyed, and can use this while painting your own true followers of the Sickly Way. 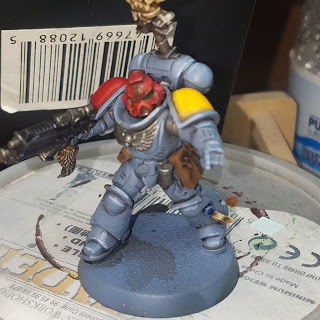 Warhammer 40k Space Wolf Primaris Space Marines -Painting Tutorial! Okay, so unit #3 in my Dark Imperium Series is going to be a Space Wolf Hunter Pack (Intercessors). The name Intercessor really doesn't fit the Space Wolf theme, and we all know that the sons of Russ will not be going into battle without properly adorned armor. 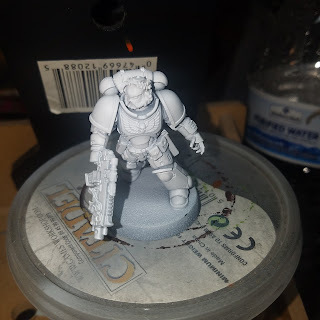 I did the base assembly and this squads sergeant was a helmetless moron, so I did the same that I did with the Imperial Fist Lieutenant, cut off the helmet in 3 sections, and cleaned up the spot, and then glued on a bigger pouch, as the spot left from the helmet was quite gnarly. I then went ahead and did some conversions on the Lieutenant, creating a Space Wolf Jarl, or chosen warrior of the Wolf Lord. I swapped the head for a Wolf pattern helmet, and cut away the power sword for and put a double bearded axe in it's place. 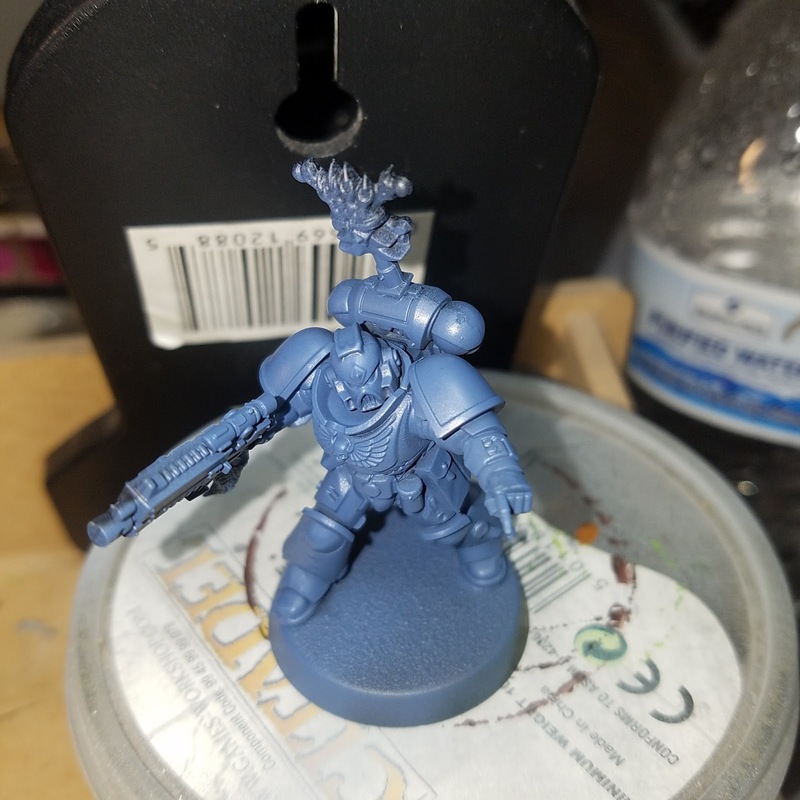 Now according to the new army book, Imperium 1, Lieutenants can only take, as an option, a Power Sword, as an option. But the rule of cool remains, and I will play it as a Power Sword. Started off with a black primer, airbrushed on of course. Then a base coat of GW The Fang, again applied with an airbrush. 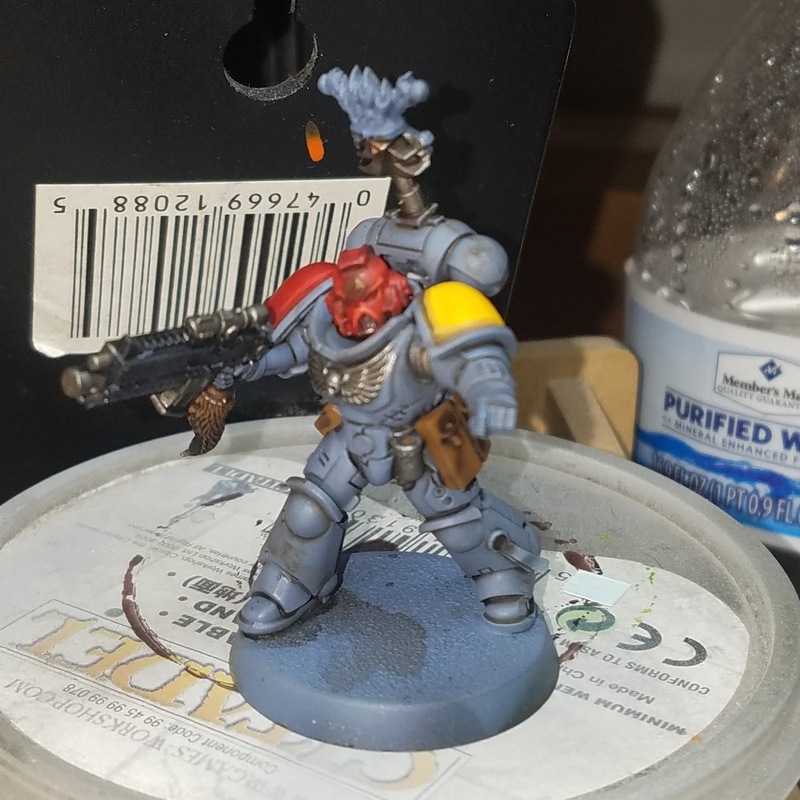 Finally a base coat of GW Russ grey to get the armor ready. 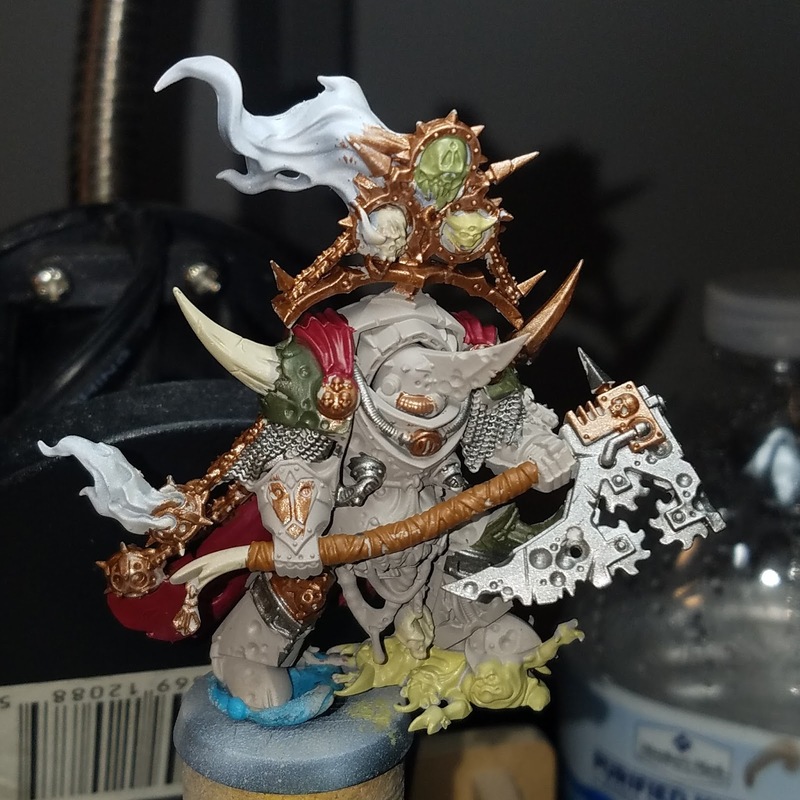 This was followed by a super thinned wash of GW Agrax Earthshade. I cut it down about 1 part wash with 3 parts GW Lahmian Medium. Lahmian Medium helps to keep the properties of the wash, but reduces the pigment load. 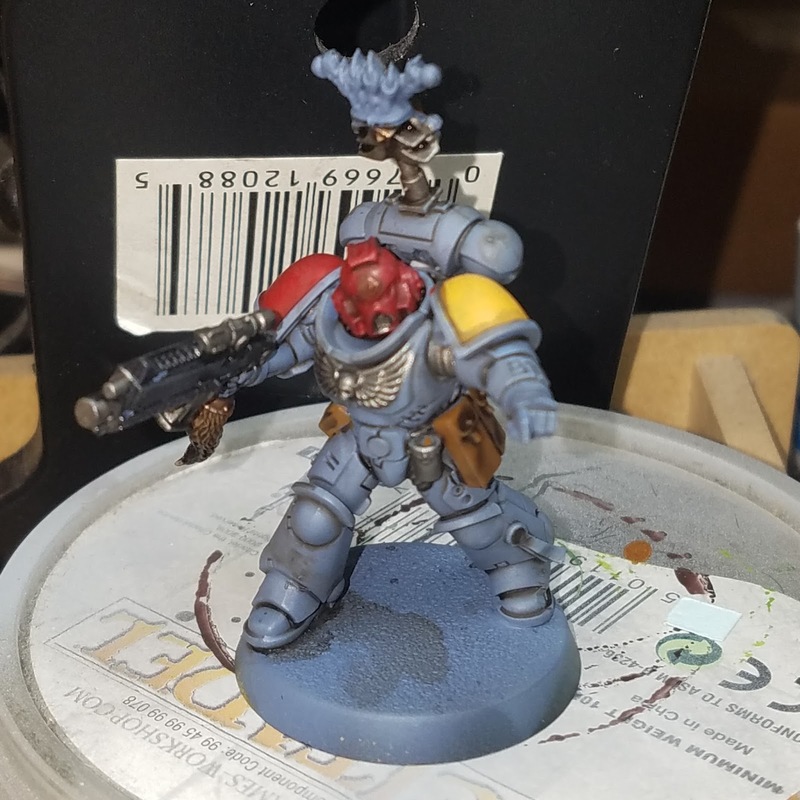 I color blocked out the red with GW Mephiston Red, yellow with GW Yriel Yellow, pouches and wolf tails with VGC Beasty Brown, and grenades, boltgun metal areas, and inner joints with GW Lead Belcher. 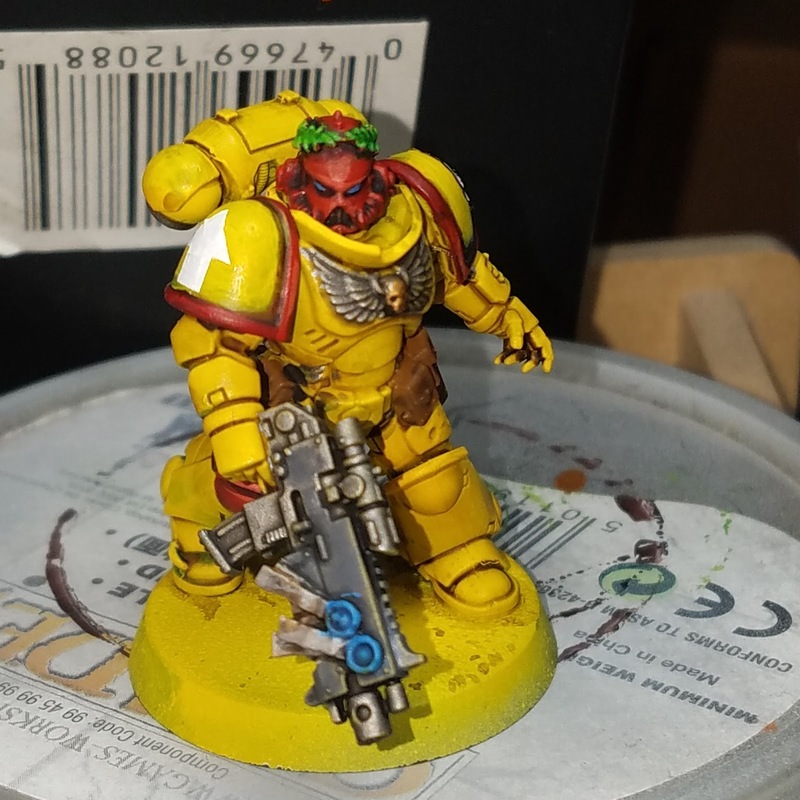 On the Yellow, I applied a pinwash of Agrax Earthshade, and GW Carrowburg Crimson on the helmet and red shoulder pad. 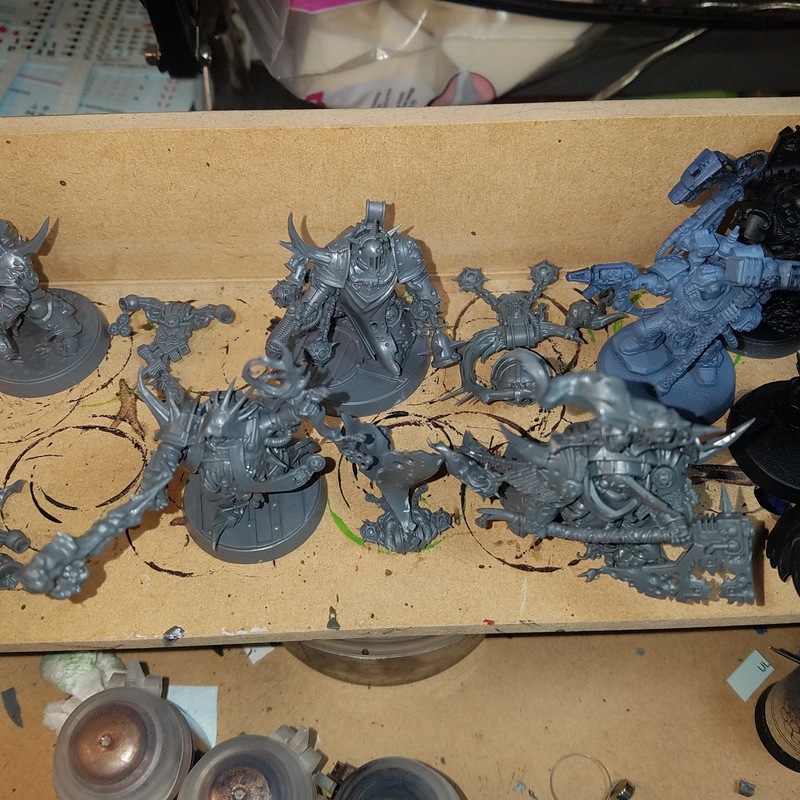 Other blocked out areas had a GW Nuln Oil wash applied. Once all the washes were dry, I trimmed up the yellow with GW Yriel Yellow, requiring 4 or 5 thin coats, and started highlighting the red, first with GW Mephiston to bring the color back up, and then a edge highlight of GW Wild Rider Red. 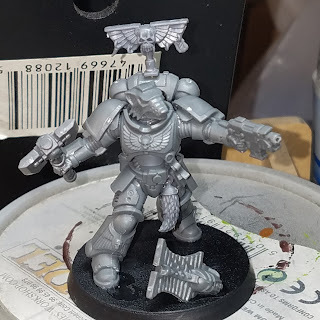 Using GW Ushabti Bone, I applied a light drybrush to the wolf tails, and applied high area highlights of GW Fenrisian Grey to the armor. 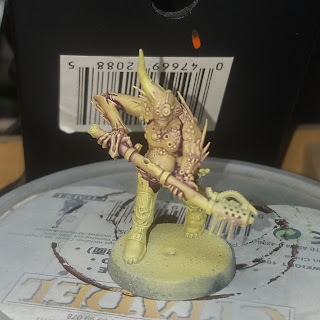 Purity seals were painted GW Rakharth Flesh, the wax seals painted GW Caledor Sky, and applied a wash of GW Argrax Earthshade. 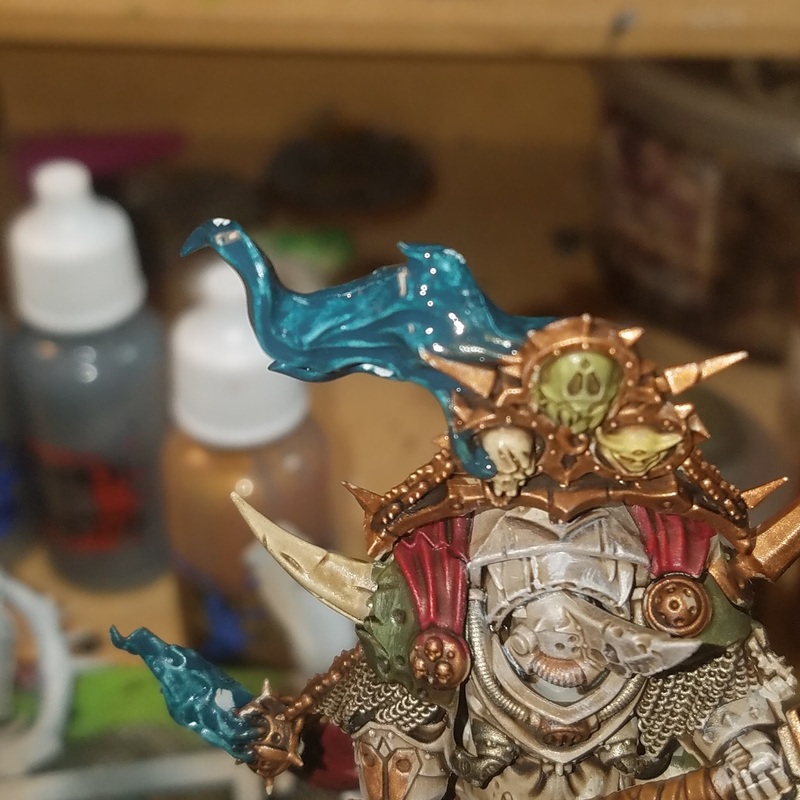 I painted the eyes with GW Caledor Sky, and applied a wash of GW Drakenhoff Nightshade. 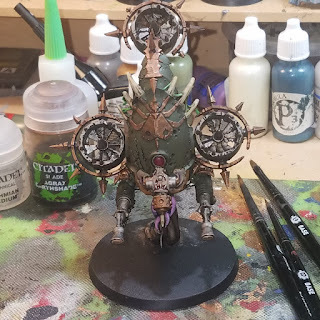 And here is the finished unit! I will apply transfers, using a lot off the new sheet, using the transfer tutorial already posted here. Summon the Sons of Russ, and make ready to cut some skein! The flip side of the new Warhammer 40k Dark Imperium core box is the Death Guard. They are the followers of the Chaos God Nurgle, grandfather of rot, disease, and decay. 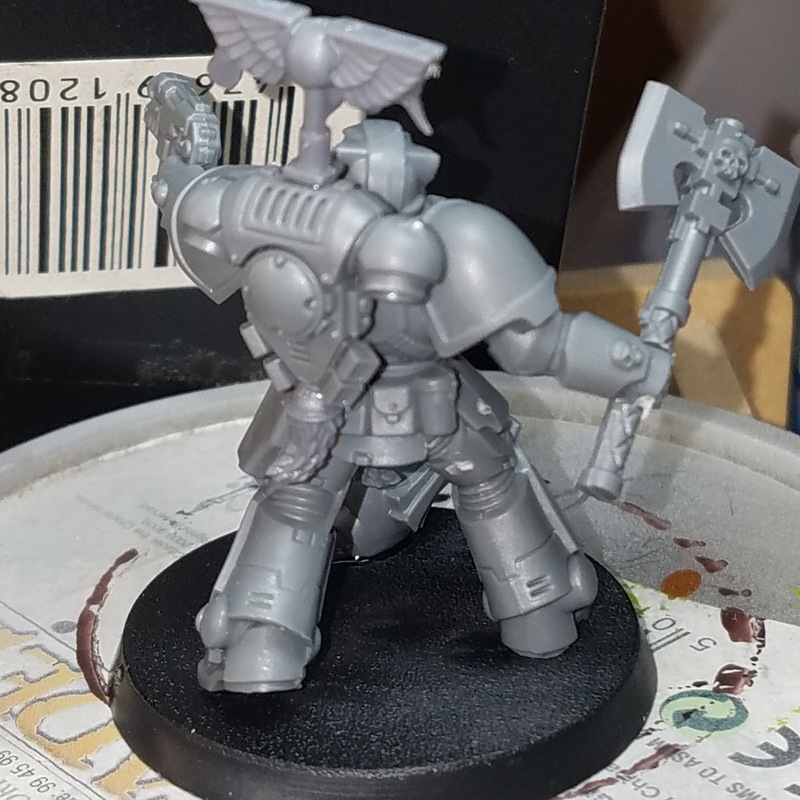 The models are a straight forward build - not much room for converting in these, but they are fantastic models. 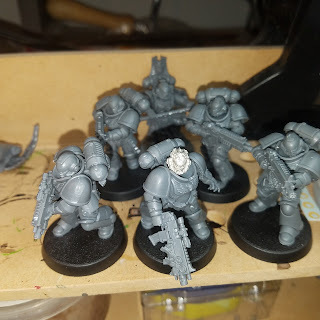 I based them on Sector Imperialis 32mm bases to match the remainder of my Chaos Space Marine models, mostly made up of Thousand Sons. 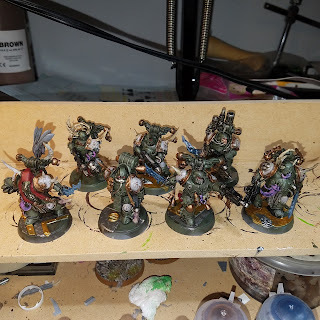 I started these with a black primer, followed by a base coat of GW Castellan Green. I started blocking out the base colors: VGC Dead Flesh for the face, GW Rakharth Flesh for the should pads, GW Leadbelcher for the chainmail, GW Balthasar Gold for pauldron trim and decorative pieces, GW Khorne Red for the head cowl and streamers, and GW Ushabti Bone for the random horns. This was all followed by a full strength wash of GW Agrax earthshade. 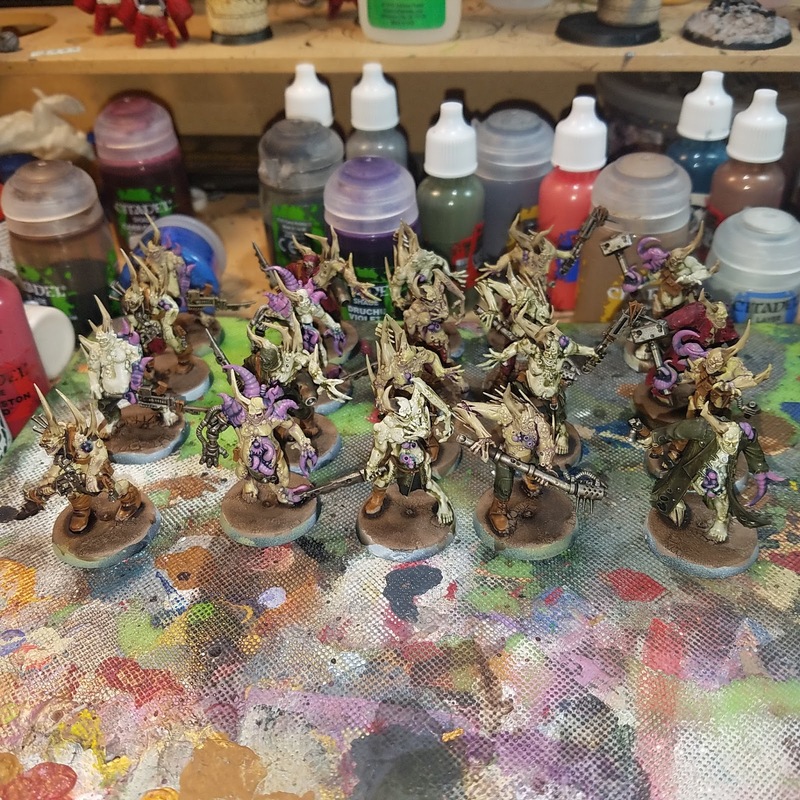 For the exposed entrails, I used GW Emperor's Children, followed with a wash of GW Drakenhoff Nightshade. 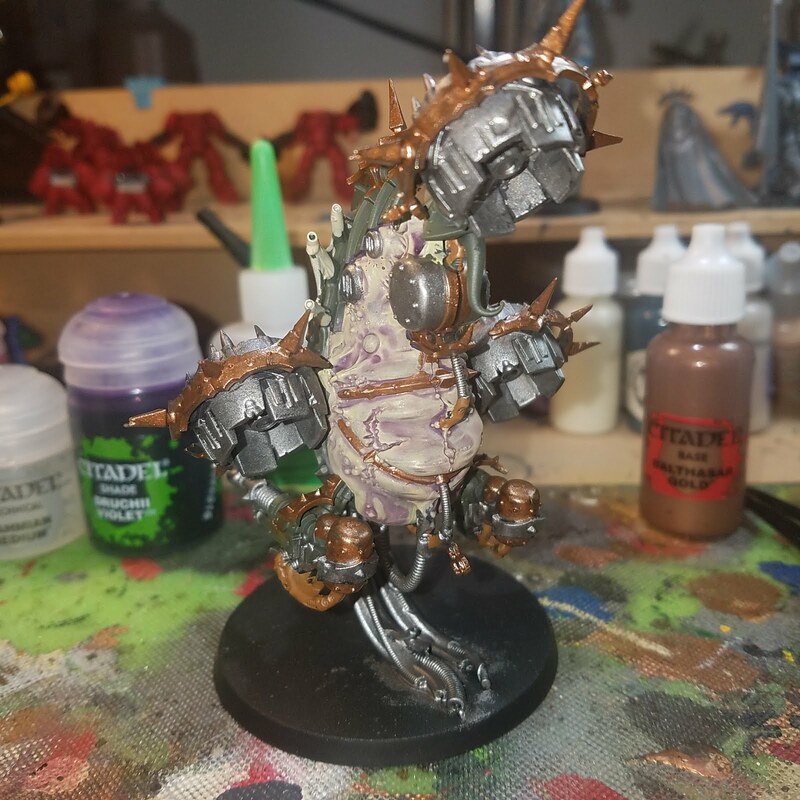 Any flesh growths were painted in GW Pallid Wych Flesh, and then washed with GW Druchii Violet. 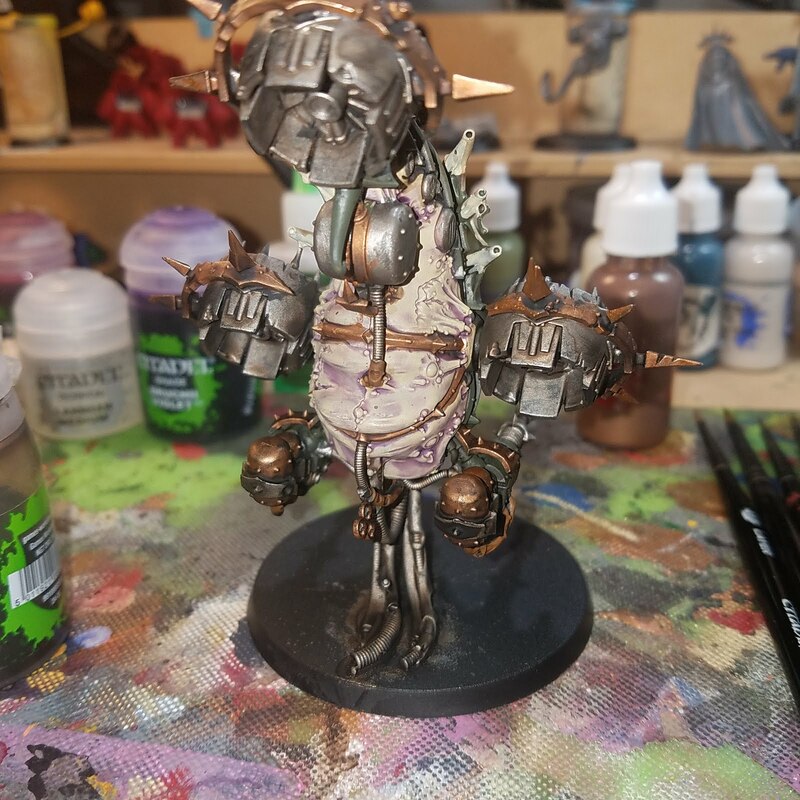 After all the washes were fully dry, I went back in and did a wetbrush on major armor plates, starting with the base colors. 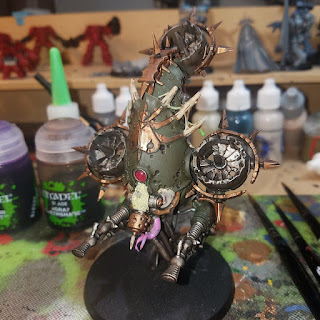 The fly was painted in GW Mechanicus Battle Grey, and then applied a GW Nuln Oil wash. On the plague knife, I applied a coat of a mix of GW Abbadon Black and Temple Guard blue. For the final step in highlighting, I did a lighter wetbrush of the final highlight colors. 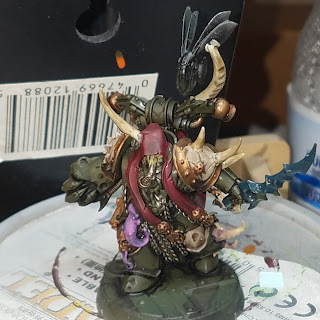 For the dark green, GW Straken Green; the red, GW Mephiston Red; center of the pauldrons, GW pallid Wych Flesh; and the bone with Ushabti Bone. 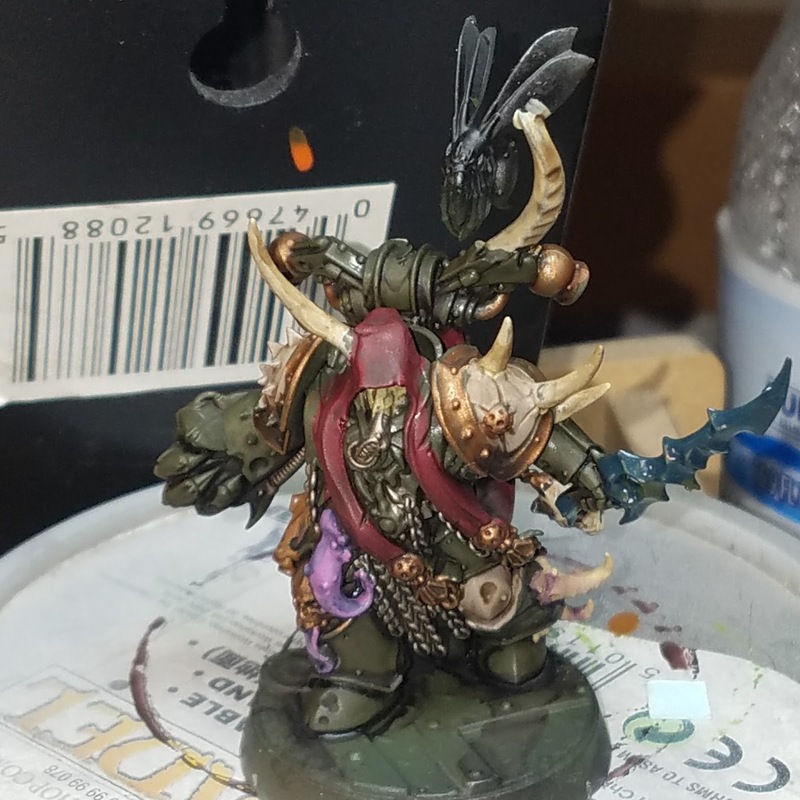 On the plague knife, I applied progressive layers of light wetbrush highlights, mixing in a bit of GW Ulthuan Grey in each successive later. And here they are! 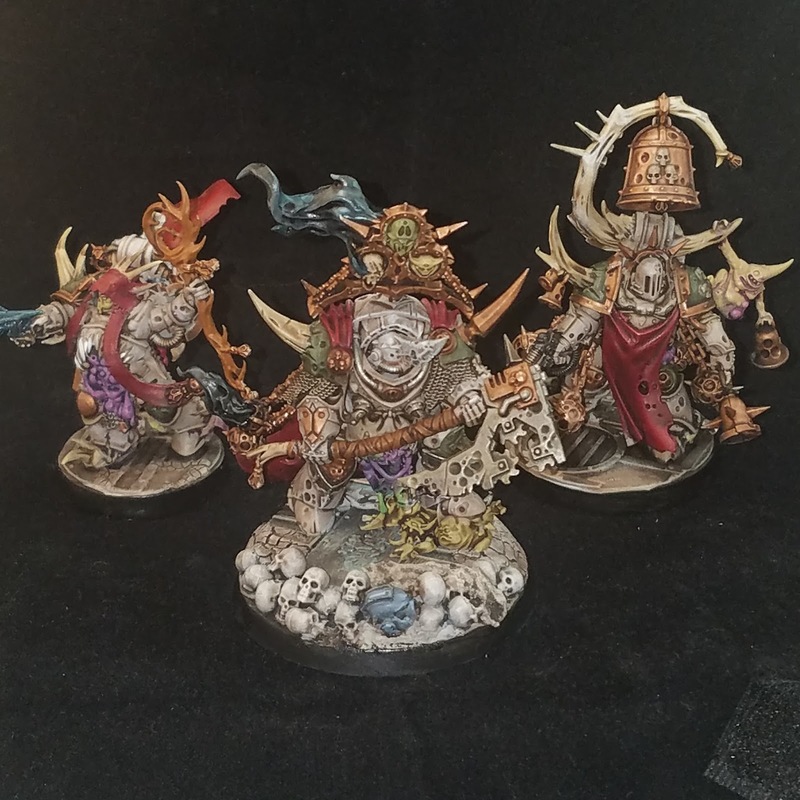 Such pretty, gruesome, disgusting models. I love them. 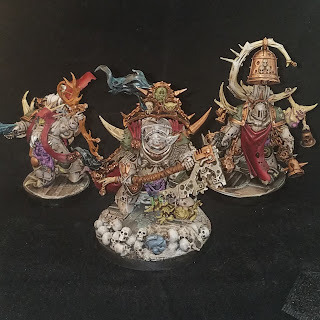 Their whole unclean vibe seems to fit really nicely in with the soul-less automatons of my Thousand Sons! 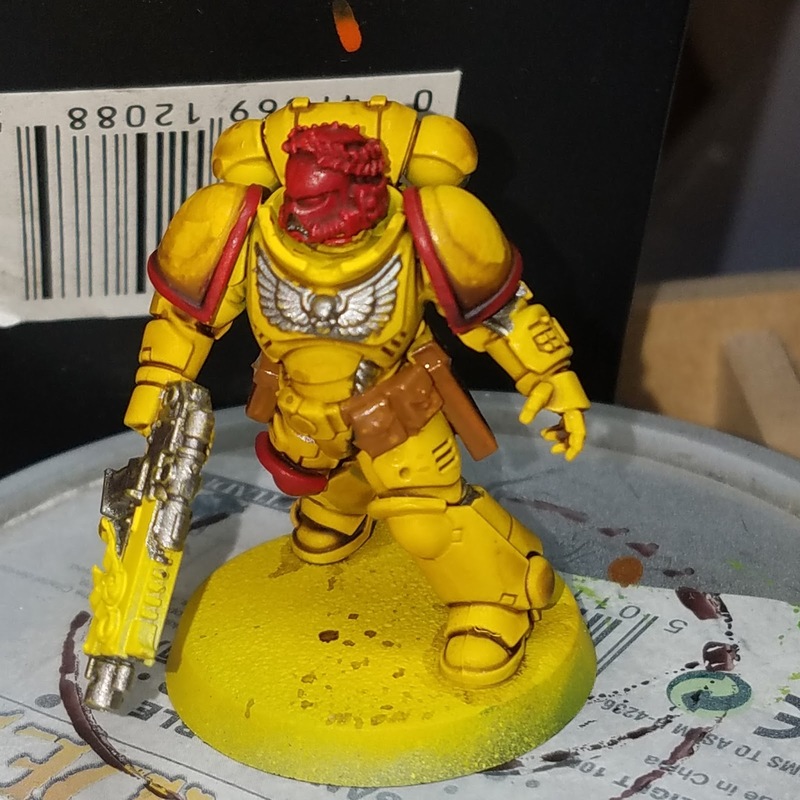 Warhammer 40k Primaris Space Marines - Lieutenant Conversion and Imperial Fists Painting Tutorial! Warhammer 40k 8th Editition - Dark Imperium - is due for release on Saturday! 40k geeks and fanboys rejoice! With this awesome new core set comes some fantastic models for Space Marine Players - Okay, well not for Deathwatch and Grey Knights - which can take advantage of army specific rules using the keyword mechanic. Jake sent me the model contents of the new core box, so that I could get to playing with putting them together and painting them up. 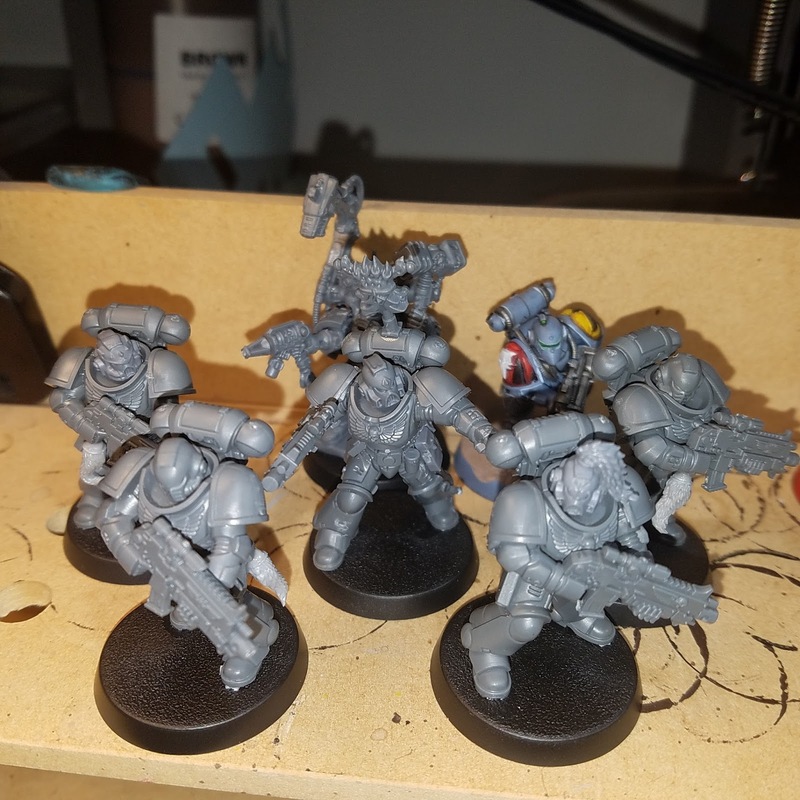 I decided, since I have 3 different Space Marine Armies; Imperial/Crimson Fists, Blood Angels, and Space Wolves, that the core box's Primaris Marines would be split up among the armies. 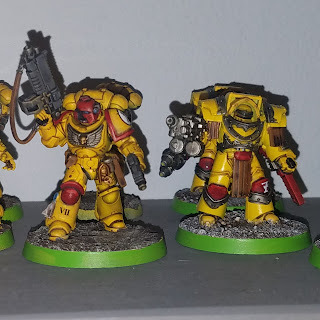 For Imperial Fists, I went with an Primaris Intercessor Squad, as well as a Lieutenant. During assembly, I decided that I wanted a different head to mark out the sergeant, so swapped for a metal IF head with wreath. 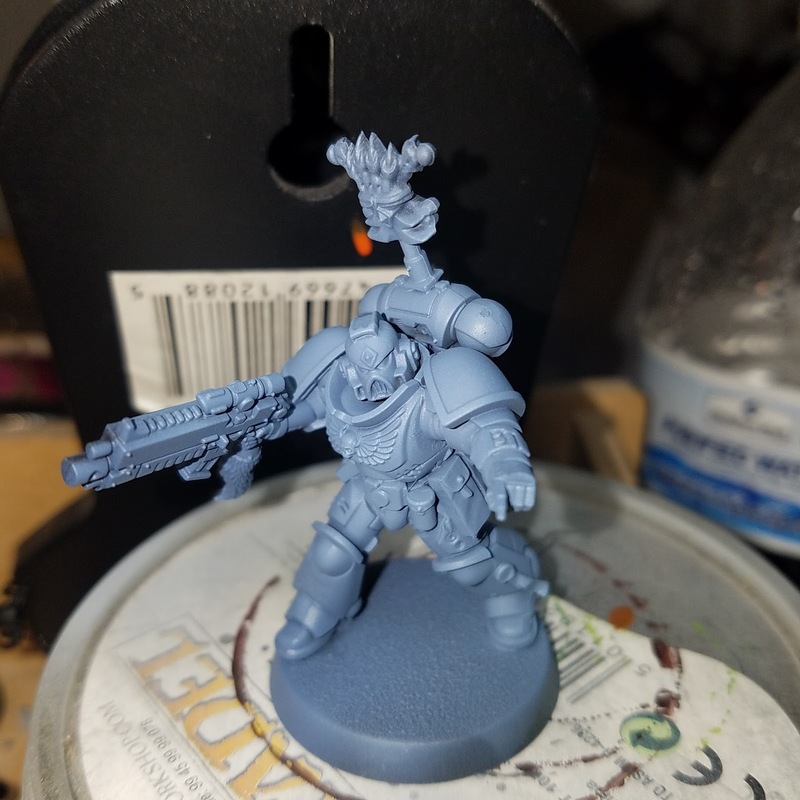 This will mirror what I have in my IF tactical squads. Using the Primaris Lieutenant with the helmetless, head, I carefully cut the helmet from his hip, and put some standard SM pouches in place instead.I cut it off with my larger clippers, once about even with the head crest, second time, right below the eyes, and then the third cut was right where the helmet met the hip. I filed the rougher edges, and then just glued the pouch into place. I started off with white primer, airbrushed on. 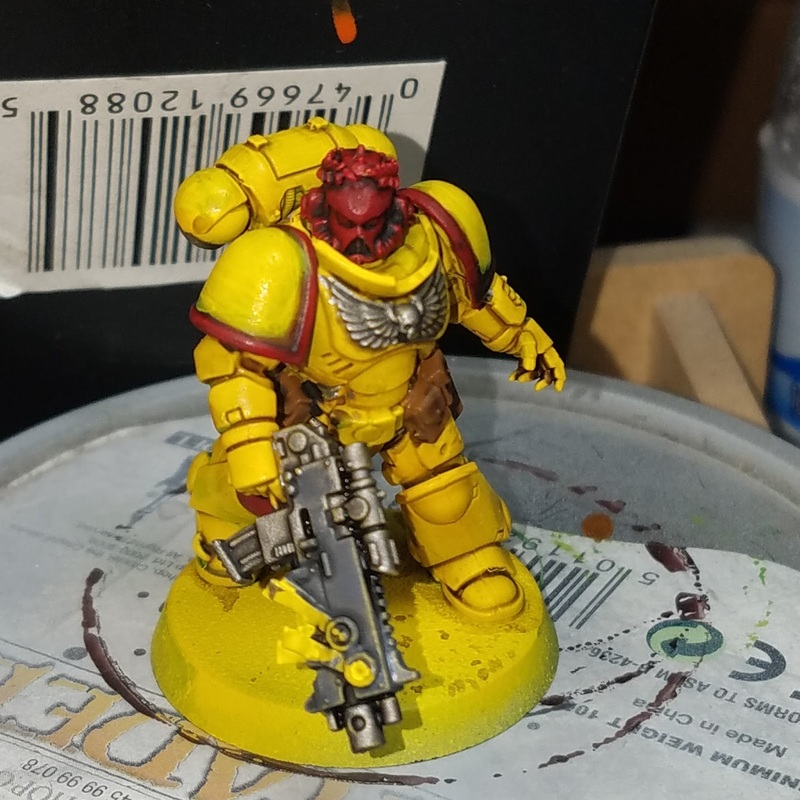 Followed with a coat of airbrushed GW Yriel Yellow, and a lighter coat of GW Bad Moons Yellow. This was followed by a super thinned wash of GW Agrax Earthshade. 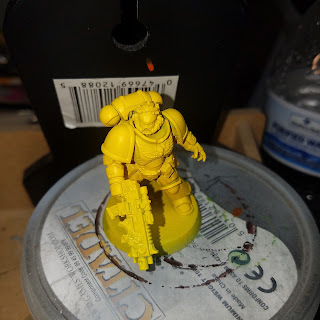 I cut it down about 1 part wash with 3 parts GW Lahmian Medium. Lahmian Medium helps to keep the properties of the wash, but reduces the pigment load. Next step is to start blocking in the colors. Extra care is needed to that the yellow isn't touched. 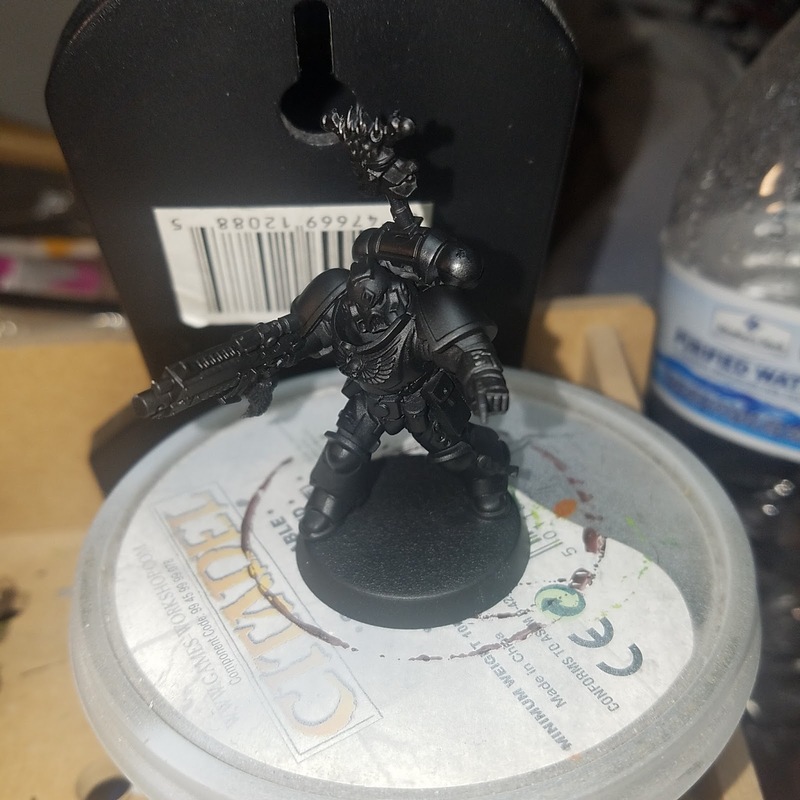 GW Mephiston Red for helmet, kneepad, and pauldron edges. VGC Beast brown for pouches, and then GW Leadbelcher for the bolt rifle, joint areas, and chest eagle. I then painted the casing of the bolt rifle with GW Mechanicus Battle Grey. All of these areas were given a wash of GW Nuln Oil. 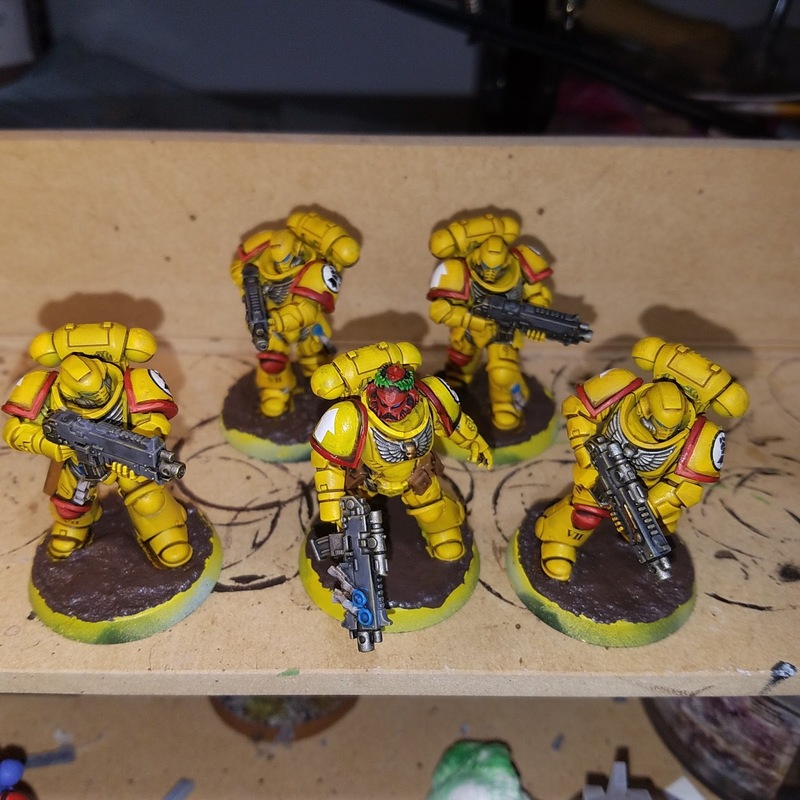 As this was drying, I cleaned up the areas where the wash on the yellow pooled. This took 5 or 6 thin coats to get it back to a clear, bright yellow! Helmet wreath was painted with GW Moot Green, then a GW Biel Tan green wash was applied. Eyes and wax seals were painted with GW Caledor Sky, and given a wash of GW Drakenhoff Nightshade. After everything was dry, I applied GW waterslide decals, using steps I will cover in a future tutorial. 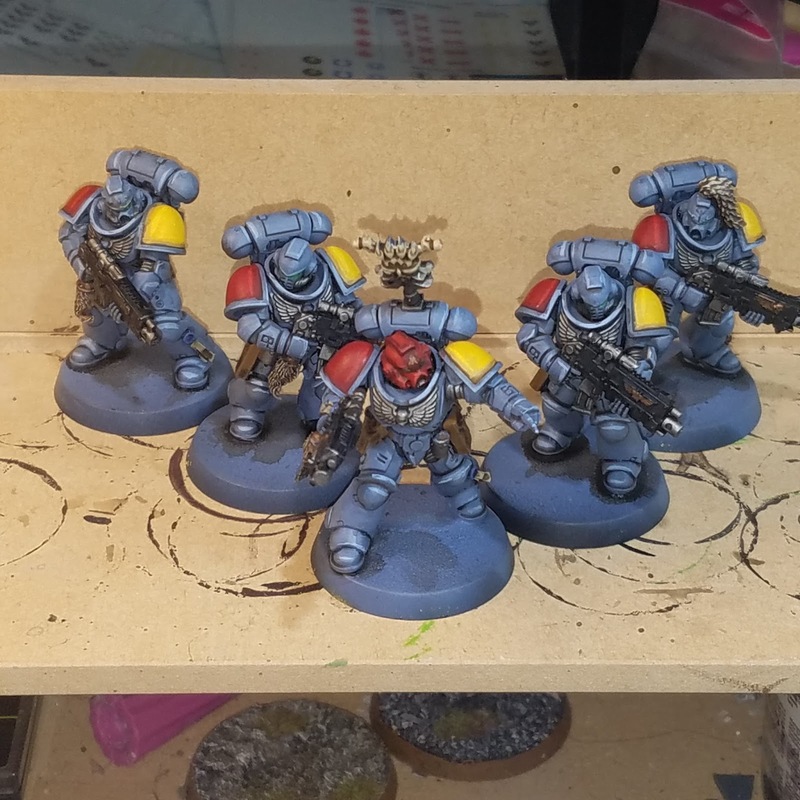 And here is the squad finished, and the bases were being started. I am doing these to match the other parts of the Imperial Fists Army I have. As a size comparison, here is the Primaris Lieutenant next to a Cataphractii Terminator. 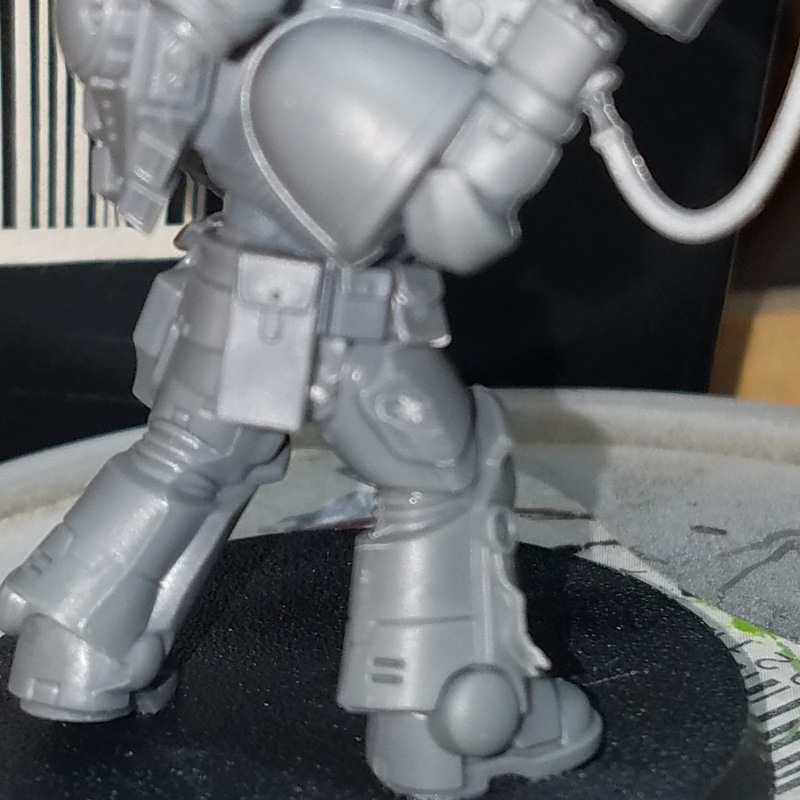 Both are on a 40mm base, and head to head, the Primaris Lieutenant is taller!